The world is our home but there are many things that happen in this planet that makes life doubly harder for all of us. At times, they are the works of nature but most of the time it is because of man itself. World peace seems like a distant memory right now as violence fills the daily news and many nations are still at war with each other. Is it really that difficult to put aside our personal opinions and look past our individual differences as we live our daily lives? Human casualties increase each year as incidents like suicide bombings, mass shootings, and other acts of terrorism attacks innocent civilians who are utterly clueless it is their last day on earth. No amount of preparation can save you from such a tragedy. After all, you can never really tell when a psychopath decides to go on a killing spree out of nowhere and you happen to be at the wrong place and the wrong time that ultimately led to your demise. It is even more saddening if a lot of people had to die because of these senseless violent acts. The US happens to be a prime target both by foreign terrorists and even local sociopaths because it is a powerful nation and anything that takes place in its soil is of global importance – a great way to make a statement where the entire world will listen. A top Australian event boss has warned there’s nothing that can be done to prepare for a Las Vegas-style gun attack on home soil. AEG Ogden chairman and chief executive Harvey Lister told The Courier Mail despite continually updating the security measures at their venues, there’s not a lot that could prevent a lone shooter attack. ‘From the initial report we’ve received about this incident, all the planning in the world unfortunately wouldn’t have prevented an attack like this from a nearby building,’ Mr Lister said. The comment comes days after the tragic Las Vegas shooting which left 59 people dead and injuring 527. Lone shooter Stephen Paddock used his sniper to open fire on 22,000 innocent festival goers from a nearby hotel before. Big events whether outdoor or indoor require extensive planning on both the organizers side, the venue officials, and even the city officials itself especially if it is such a big venue that will attract lots of people and can go on for days like major outdoor concerts, the very same concert where a madman started shooting on concert-goers like crazy from his hotel room for 10 minutes or so. No amount of searching and scanning the concert-goers can predict that such a tragedy will befall them that night when the danger is actually so far yet so near at the same time. Perhaps the most stark example of the crowd-building dynamic is in New York, where the city’s 36,000-officer department regularly goes on high alert for such events as the New Year’s Eve Times Square celebration, the Macy’sThanksgiving Day parade, Monday’s Columbus Day parade, even some Yankees games. For such events, the NYPD puts officers with body armor and high-powered weapons around the perimeter, sharpshooters on nearby rooftops to scan the windows of other buildings for threats, and cops with bullhorns on the streets instructing gawkers in nearby buildings to keep their windows closed. They also have detectives ramp up security sweeps at hotels, particularly ahead of the holiday season. And the NYPD has a program to train thousands of private businesses and employees, from housekeeping staff to security, on how to spot explosives or tell a golf bag from a gun case. Events organizers take a lot of precautionary measures to ensure the safety and security of people who attend big events like this one that is highly similar to the Las Vegas shooting where people are out in the open and are easy targets for a murderous maniac. 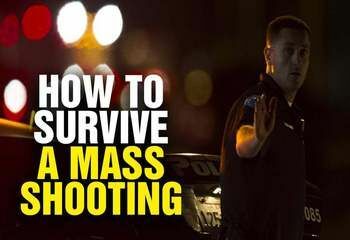 It’s all the more reason for events organizers to coordinate with local law enforcers for backup support in case something terrible happens like a mass shooting, which is probably something that did not cross the minds of those who died and got injured that unfortunate day. The risks are always there but if criminals can see plenty of police officers roaming around events or even in their daily life, they may be discouraged to carry out their evil plans and rethink their actions, and in doing so, protect the lives of the public one day at a time.